In my last post, I outlined how to remove some of your sticky ”followed non-followers” in your Twitter account. These are the accounts listed in your FriendorFollow array as the ones you follow but they don’t follow you. And they just won’t disappear no matter what actions you take. In that discussion, I mentioned using TweepSync to cross-reference those ghost accounts with operational ones. Then you can identify and remove the rogue IDs from your Social Array. Well, if you started using TweepSync, you probably noticed that you automatically started following two new accounts which don’t follow you back. And you can’t get rid of them either. These accounts belong to the team that developed TweepSync. Surprisingly enough, it was FriendorFollow that ratted them out. FriendorFollow has a new feature that separates out the new unfollowers from those that have been around for a while. So if you just started following a Twitter account, their avatar will show up as a new unfollower. These new people haven’t had time to review your account and follow you back. Similarly, if someone decides to stop following you, they will show up here as well. It gives you an idea of who wants to hear what you have to say and who you are boring to tears with your Twitter stream. Now, Back To The TweepSync Twitter Challenge. After clearing out some of my inactive followers, I found two new accounts listed as “followed non-followers”. This meant that either I had two accounts that stopped following me, or I had recently started following these two new accounts. I was really shocked to find that I continued to follow these two mystery accounts after I specifically unfollowed them. I realized that I had a couple of rogues on my hand after unfollowing them 6 times and my account continued to re-follow them three minutes later each time. It was as if I had lost control over my account! I didn’t resolve the issue until I remembered a few security incidents that allowed several “enterprising” individuals to rack up an insane number of followers. They did this by encouraging unsuspecting individuals to run compromising malware which gave them access to their hosts’ accounts. After remembering the incident, I logged into Twitter and cruised on over to the “connections” page to see which applications I had given access to my account. And I found my culprit. As I stated above, TweepSync was the guilty party. Or more correctly, it was the parent application, Tweep Tycoon, that was signing me up to follow these two accounts. Even after unfollowing them several times. If you use TweepSync, even once, the app forces a follow between your account and its developers. 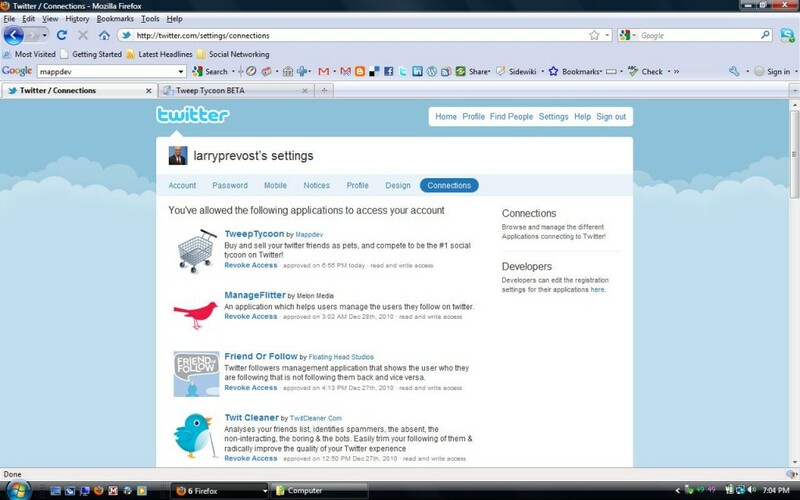 That follow exists as long as you are connected to the parent application, even if you never use TweepSync again. 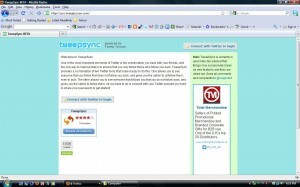 The way to end the cycle is to revoke access to the parent account for TweepSync, called Tweep Tycoon. Once you do this, you will have no problem removing the accounts that have added themselves. Now I have no issue with developers setting up their applications to get their users to auto-follow them. Maybe they did it to get feedback. Maybe they did it for customer support reasons. Or maybe they implemented it for future sales reasons. Just tell them what’s happening. The issue I have here is that they implemented the auto-follow feature without my knowledge. It remained in effect after I stopped using the application. The application I’m using now, TwitCleaner, does the same thing with one exception. The developers of TwitCleaner will send you a message detailing how they will set you up to follow their account, and vice versa. They will then DM you with a link to their findings. And they tell you that you are free to remove the account off of your follow list. If also provides some comprehensive information to boot. As I said before, setting up the system for users to auto-follow the development team is not a problem. However, setting up your clients to follow you without their knowledge or control is a problem. It reminds me of that little DRM fiasco that Sony tried a couple of years ago. This is why I’m using TwitCleaner and ManageFlitter now. TweepSync is a decent application and I’ll continue to use it when the occasion arises. But with the state of affairs with spammers right now, I would encourage developers, sales people and online marketers to be as open as possible. 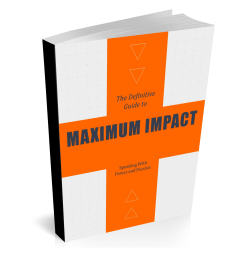 Let your prospects know what your service will do, especially if you plan on turning them into your followers. And for everyone else using Twitter, I would encourage you to regularly review which applications you are giving inside access.